Construction has been completed on one of the first Deepwater Horizon restoration projects. 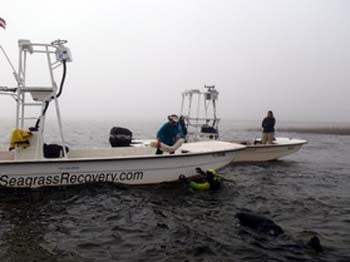 The project restored submerged aquatic vegetation at 17 sites where response activities caused scarring of seagrass beds. Deploying sediment tubes from boats in the Gulf of Mexico. Seagrass is scarred when motorboat propellers come in contact with the beds. This is what happened in some areas of the Gulf of Mexico during response activities after the BP oil spill. The sites of the scarring stretched from Apalachee Bay, Florida to Perdido Bay on the Florida-Alabama state line. NOAA’s Restoration Center developed assessment methods­—including aerial analysis, identification of restoration techniques, and calculations of planting needed. 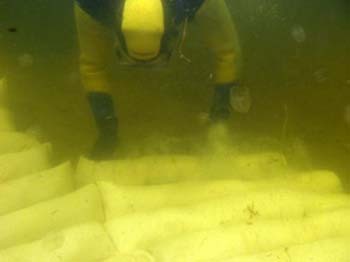 Tubes placed in scarred areas biodegrade and release native sediment before planting seagrass. To restore areas of seagrass that have been damaged by propellers, more than 1500 sediment tubes were placed at the 17 sites. The sediment tubes are made of specialized cotton that biodegrades, releasing native sediment. Then seagrass will be planted in the partially degraded tubes this spring and monitored for the next five years.